Carbonated waters defined: What are seltzer, club soda, soda water, Perrier, San Pellegrino, and other common terms? Few of us are 100-percent confident in our knowledge of the nuances of water with bubbles in it. So, with the weather getting warmer, and as a service to those who like their water aerated, I present a guide to common terms for various kinds of carbonated water. Carbonated water, sparkling water, bubbly water, and fizzy water are umbrella terms describing water that has been pressurized with carbon dioxide gas to produce effervescence, i.e., bubbles. Carbonated water can occur naturally—as is the case with water from certain mineral springs—or it can be created artificially with carbon dioxide cartridges or tanks. The carbonation process gives water a slightly acidic pH. Club soda is artificially carbonated water to which sodium salts and/or potassium salts have been added. These can include table salt and sodium bicarbonate (also known as baking soda). These alkaline substances are added to carbonated water to neutralize its acidity and to mimic the flavors of naturally occurring mineral water. Perrier is a popular brand of sparkling mineral water bottled in Vergèze, France. Although the water from the spring in Vergèze is naturally carbonated, the Perrier plant collects the water and the carbonic gas from the spring separately, filters the gas, and then recombines the water and gas; this process results in a more consistent product. Perrier is acidic, with a pH around 6, and it contains calcium, chloride, bicarbonate, fluoride, magnesium, nitrate, potassium, sodium, and sulfates. San Pellegrino, stylized S. Pellegrino, is a popular brand of sparkling mineral water bottled in San Pellegrino Terme, Italy. The water from the spring is not naturally carbonated; the San Pellegrino plant adds “carbonation from natural origin.” San Pellegrino is acidic, with a pH of 5.6, and it contains the same minerals as Perrier, plus lithium, silica, and strontium. Soda water is an ambiguous term, probably because it’s been around for a long time: It is what the first commercially available artificially carbonated water was called in the late 18th century. Today, some people use soda water synonymously with seltzer; other people use it synonymously with club soda. If you are ordering at a bar, and you are persnickety about the salt content of your sparkling water, use the term soda water at your own risk. Tonic water isn’t water; it’s a sweetened soft drink containing carbonated water (as do most sweetened soft drinks). Quinine, the antimalarial compound found in cinchona tree bark, was originally added to tonic water in large quantities for its medicinal effects but is now added to tonic water in trace quantities for its unique bitter flavor. 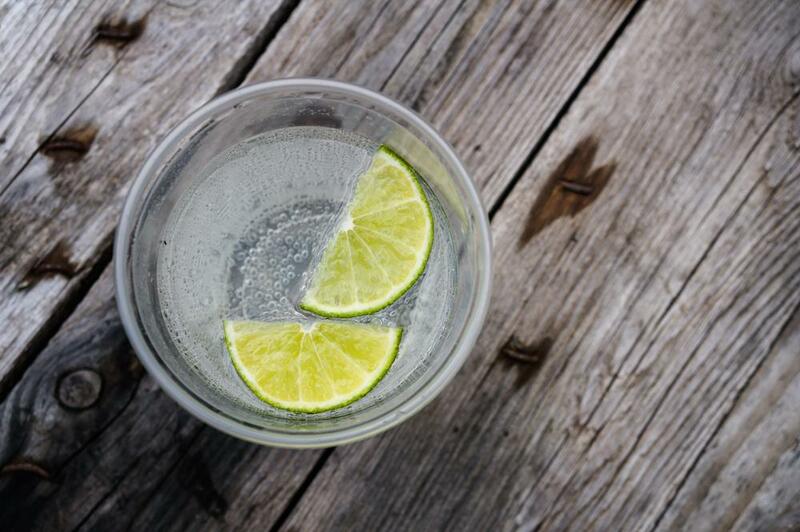 Tonic water is best known as a mixer with gin.